Ever since I fell in love with the Viaje Fifty Fifty Red Label I’ve been on a bit of a Viaje binge. Practically smoking anything that has a Viaje label on it. 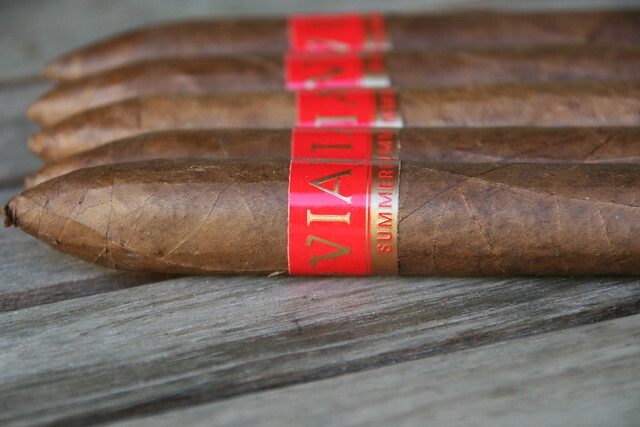 I had never heard of the Viaje Summerfest but after some digging I found out that, like most Viaje productions, are a limited release (200 boxes of 30) and is part of the Viaje Seasonal Series made up of the Summerfest and Holiday blends. Unless you’re visually impaired (that’s the politically correct term right?) the first thing you notice about the Summerfest is it’s 1.5″ unfinished shaggy foot. Now, the Summerfest is by far the first cigar to feature a shaggy foot but I don’t think I’ve seen a shaggy foot that measures that long bringing the cigar to a whopping 8″ in length. Video runs close to 12 minutes and to be perfectly honest I was less than impressed with the Viaje Summerfest. Too confusing, too time consuming, too expensive and most of all…too boring. The most exciting/interesting part of the Summerfest is the shaggy foot. I’m not sure the shaggy foot is supposed to bring anything to table but outside of it’s “shock and awe” qualities I didn’t find that it did. Maybe its just me? Maybe I missed something? Maybe the Viaje Summerfest is a prime example of a gimmicky cigar? As always, you tell me. Very nice work Jerry, starting to have a soft spot for Viaje cigars myself. I swear…if i were the God of all things, i would give you your own tv show. When you posted those photos yesterday it looked like the shaggy section was much, much shorter. Seeing the cigar in your hand brings on a “WTF Moment”. I’m not very experienced with Viaje product but I’m a big fan of the Platino and Fifty-Fifty lines, but this one isn’t interesting me at all. Great job on the review. it’s an optical illusion, jerry just has child sized hands. Damn that is a hell of a shaggy foot! I always have trouble on the Gurkha Shaggy XO getting that shag lit up properly, I would hate to see me doing this one. I have only had 1 Viaje in my life so far and I would love to search out these limited releases sticks but really do not have the money nor inclination to do so. With how plain this one sounds, I am kind of glad I don’t! Summerfast Brushfoot was my very first Viaje back in August. I tried lighting the damn shaggy (against the advice of the shopworkers there that day) and couldn’t get a decent flame or burn or draw no matter what…so, then I took their advice and took my Xikar scissors to the brush-foot, leaving just about 1/8″ of shaggy at the end…then relit it at which time it worked just fine. There was only one size that came with the ridiculous brush-foot, but that was the only size left, too…the guys there said that the other size was more popular. As far me, I liked it, but can’t say I loved it. My favorite from Viaje so far is the Oro: thankfully one of their regular lines that won’t be gone in a couple months! Walt – Jerry is pointing at me again! Loved the review but most likely will skip this cigar. Gimmick for sure! I’m not a fan of decorative elements at the foot of the cigar either, whether it be shaggy, “unfinished”, or just a big plug of tobacco that sticks out, for practical reasons- It’s a hassle to store, and a hassle to light. That being said I’ve also been on a Viaje kick lately, and am still tempted to try them out. Partly because you know me, I gotta try everything, but also because I want to experiment with lighting it.